Yes, seriously. 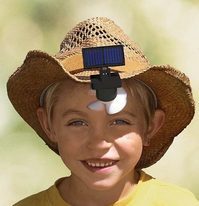 OK, the Australian looking child and matching hat aren’t included, but $10 will get you a clip on solar fan that can be attached to your favourite baseball cap/trilby/turban. It uses a mini photovaltic panel to power the mini fan, and should keep you slightly cooler- though your blushes may counteract that!